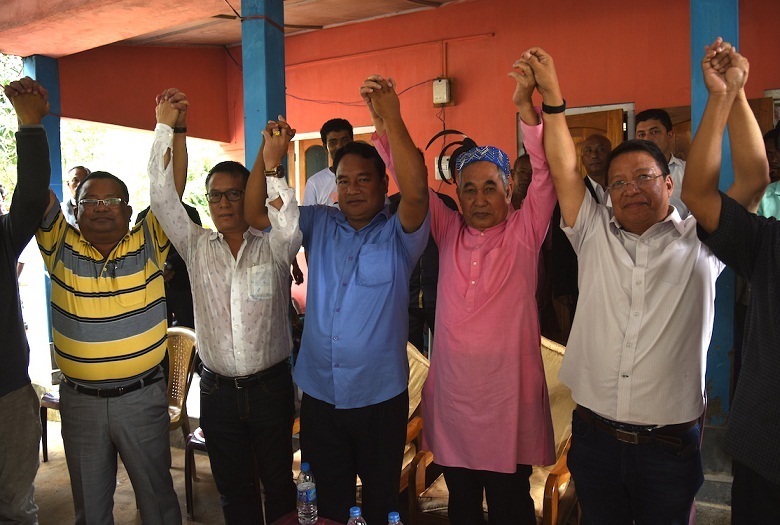 Deputy Chief Minister of Manipur Yumnam Joykumar Singh and Sports and Youth Affairs Minister Letpao Haokip on Friday campaigned for NPP candidate Clement G Momin. Singh and Haokip accompanied by Chief Advisor to Chief Minister of Meghalaya Thomas Sangma and State Working President of NPP S B Sangma addressed party supporters and workers at Latri and Sonabil under Ampati constituency. “Mukul Sangma and Congress party were never concerned for the people and the future of Ampati constituency. In the name of development few roads and infrastructure were created in the constituency but educational facilities in Ampati and South West Garo Hills are very poor. This is a testimony to their failure to create an environment for the future of our children,” Yumnam Joykumar Singh said. Singh said former MLA of Ampati Mukul Sangma who vacated the seat for his daughter Miani D Shira failed to provide educational facilities for the children and the youth because he was sacred to create an educated society. “He (Mukul Sangma) failed to create the basic facilities in education, health, social security and economic stability. Mukul terrorized the people with fear and created a perception of development, which is not a reality,” Singh added. He said that Mukul Sangma has betrayed his own people. He praised Chief Minister of Meghalaya Conrad K Sangma as one of the most dynamic Chief Ministers in the country and sought for people’s support to ensure that Clement G Momin wins the election with a thumping majority.